Northern Ireland's main parties have agreed to transfer police and justice powers in April, opening a "new chapter" for the long-troubled province, Prime Minister Gordon Brown said Friday. "We are closing the last chapter of a long and troubled story and we are opening a new chapter for Northern Ireland," he said, confirming the accord between the Republican Sinn Fein and pro-London Democratic Unionists (DUP). The government has agreed to provide an extra £800 million to fund the transfer of law and order powers from London to Belfast on April 12, he said. "This agreement is the surest sign that we are not going back to the bad old days of the past," said DUP leader and First Minister Peter Robinson. 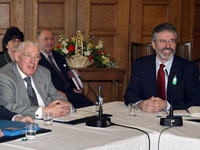 The agreement came after nearly two weeks of often tense negotiations between the parties -- long bitter enemies -- which have shared power in Belfast since 2007. Britain and Ireland helped broker the 1998 Good Friday Agreement, which largely ended three decades of violence that killed at least 3,500 people and led to the creation of the power-sharing executive. But Northern Ireland is still dogged by sporadic violence. A policeman and two soldiers were shot dead last year in attacks blamed on dissident republicans and a policeman lost a leg in a car bomb last month.